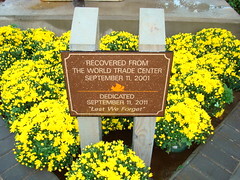 This is the 10th anniversary of the terrorist attacks on America.. What effect did this have on your writing, if any. Was it short term effect or from that point on. Or write story, poem, song, or a remembrance or dedication to those who were lost and the heroes that rose to the occasion during this frightening time in our country and seen around the world. Ten years ago, this week, an extraordinary tragedy devastated the city of New York but the horror and shock ricocheted around the world. It was one of those events in history that we can all remember exactly where we were and what we were doing. Over the last few days I have been watching footage and documentaries on the fall of the Twin Towers of the World Trade Centre and the events that happened just prior and just after this horrific event. That day changed countless lives in so many ways. It scarred the skyline of Manhattan, New York and it broke the heart of the modern world. This was not only a nation that was affected but all around the world the emotions so raw and so vulnerable echoed in all our hearts. On the day it happened I was millions of miles away but in my heart I was right there as shocked and horrified as anyone.But for me, what stands out in my mind of that day is not just the devastation but the small mercies and bravery of humanity. I remember the ordinary heroes that stepped up in the hour. I remember the countless heroes that walked into the heart of devastation to save who they could. As I watched the events unfolding I wondered what would happen if I were thrust or someone I love were thrust into that situation. How would I react? How would they react? I was also rocked again by the realization that tragedies, large and small, happen every day and that we cannot stop them. But how we react and how we act in the face of these tragedies is the living legacy? Did this affect my writing and how? Yes, it did. It made me realise that even very ordinary people one would not notice can become extraordinary heroes. I write a lot of poetry when I am faced with dark emotions and those days just after 9/11 I was assailed by images that were forever imprinted upon my mind and emotions that were imprinted on my heart. But when the human heart encounters tragedy, we have to find something to hope for and to live for. I also realised that words are powerful, whether spoken or written. 9/11 caused me to start sharing my poetry with others. I have always written poetry as this is the way I handle events in my own life. Call it my personal therapy. But before then I had not shown anyone my poetry. I had written it down and hidden it away. But 9/11 made me realise that we are all human beings. We all experience tragedy in some form in our lives. We all must fight darkness with light. This is the human condition. But human beings need solidarity with each other. We are social creatures who need compassion, empathy and mercy. I realized that although my own dark moments may be personal to me, the emotions evoked and felt are universal. When I saw and heard about the ordinary heroes making a difference after those events, I wanted to be able to reach out in solidarity. My method of communication is words. I needed to use my words to convey emotions. So from that day I vowed that I would share what I had written because people need to know we all know both darkness and light in our lives. But it is the light that gives us hope and faith to continue. Emotional vulnerability is not a weakness but a strength because that is how we learn empathy.This is one of the poems I wrote soon after 9/11. Can freeze your soul in a prison with gates of fear? Thrown from my place of peace, how could I fall free, chained? May we never forget 9/11 nor the events after that day. My heart goes out to the countless people affected by the tragedy of that day. May the Grace of God cover the scars that will always remain with those affected and those that witnessed. May we never forget the ordinary heroes that acted when they needed to without thought for their own safety. May the courage of New York’s ordinary heroes be an extraordinary inspiration to us all. Previous Post Hook that Agent! Thanks Eden…Yes senselessness sums it up perfectly. May we never forget our humanity. Thanks for commenting. Beautiful post and poem, Kim. It’s an event that was felt the world over, crossing cultural, racial, and language barriers. Unless you’ve lost your own sense of humanity, you could not watch images of the burning towers and people jumping to their deaths without feeling horrified. Since 9/11, we have rid the world of Saddam Hussein, Osama Bin Laden, and discovered no WMDs in Iraq, but the senselessness of wars and death continue. I remember the people who died and their courage. It’s the only sense of it I can make for now. Ah... Perfection. This leather is to—die—for. My first #chicsparrowmockingbird #chicsparrownightingale in pocket plus. Ooh...scrumptious new leather tns to play with...My first #chicsparrowodyssey #chicsparrowartemis in pocket plus. On the Desk Working on my new secret Project. CampNanoWrimo begins. April 1st....And so the lovely madness of Camp Nanowrimo begins. What’s on my bedside shelf? All rights reserved Kim Koning unless otherwise attributed. If sharing, please link back credit and attribution to Kim Koning and this website. Thank you.